Rio de Janeiro has been nicknamed the Cidade Maravilhosa – “Marvelous City”, and how true it is. 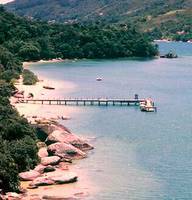 Nestled in the heart of Brazil’s southeastern coast, the cosmopolitan metropolis has just about everything to offer. Salvador, capital of the state of Bahia, was the first major port and the capital of colonial Brazil for almost two centuries. Known as the ‘African heart of Brazil’, removed from the artificial glamour of Rio de Janerio, the city lies between green tropical hills and broad beaches along the bay of Todos os Santos. It was built on two levels with administration buildings and residences constructed on the hills; forts, docks, and warehouses on the beaches. To this day the city is still divided into upper and lower cities.